Swan Hellenic's smallish Minerva sailing past the village of Velsen Noord at the Northsea Canal passage to IJmuiden and the North Sea at the 7th of july 2012. Swan Hellenic Cruises was formed in the 1950's to sail highrated cruises in the Mediterranean. 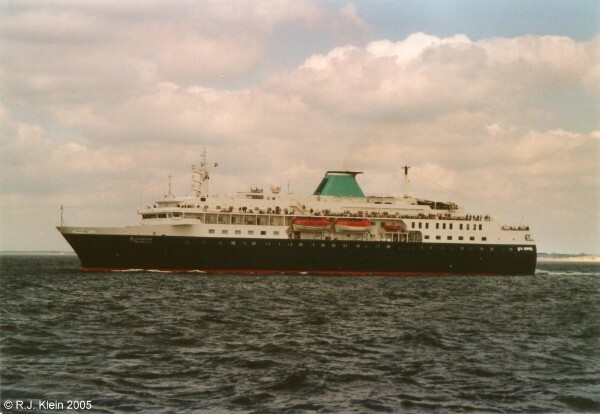 Between 1974 and 1996 they operated the small Orpheus on charter from Epirotiki, but in the mid 1990's they were searching for a replacement for this aging vessel built as the nightferry Munster on the Liverpool-Dublin route. Talks about this started between P&O (the managers of Swan Hellenic), V-ships (the owners-to-be of the new vessel) and the Mariotti-wharf in Genoa, although the wharf had no room to built such a ship. Thus instead, they searched for an exsisting hull abroad and they found an idle Sovjet research vessel on the Okean Shipyard in Nikolajev, Ukraine named Okean. The hull for this ship, that was intended to locate allied submarines in the cold war, was laid down as yardnumber 001 on the 30th of March 1989, just months before the fall of the Berlin wall. Work was halted untill 1994, when the hull was aquired by V-ships. It was completed up to the main deck and then launched on the 10th of december 1994 before being towed to Genoa for the completion to a passenger ship on the Mariotti-wharf with yardnumber 595. 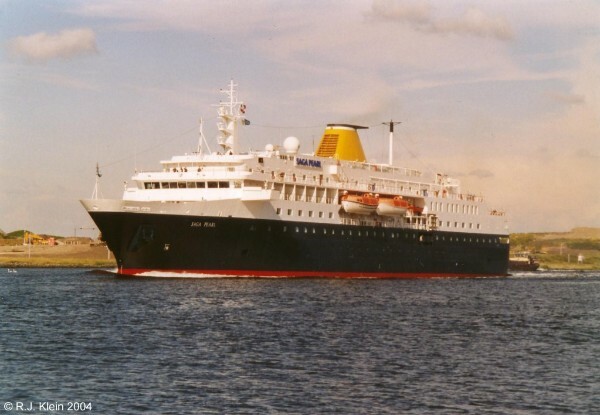 In April 1996 the completed ship entered service for Swan Hellenic as Minerva. her maiden voyage took her from Genoa to London via several Mediterranean ports. She was named in London on the 7th of june that year by HRH the Dutchess of Glouchester. For Swan Hellenic, she would sail European, Mediterranean and Far Eastern cruises. She had become a nice, small ship with accomodations for 428 passengers on six decks. She has a tonnage of 12.331 and her length is 133 meters, beam 20 meters and draft 6 meters. The ship sailed for Swan Hellenic only a few years, before she was chartered out to Saga Holidays, a relatively fast growing British company that specializes on holidays for elderly passengers. Besides Saga Pearl the new name for Minerva, they also operated the Saga Rose and Saga Ruby the former Sagafjord and Vistafjord of Norwegian America Line. Between 2003 and 2005, Minerva had been the Saga Pearl for Saga Holidays, catering for elderly passengers. After just two years of service for Saga, Saga Pearl was transferred to another company again, this time she became the Alexander von Humboldt for the German Phoenix Reisen in 2005. The only change in her external appearance was the changed funnel-colour from her Saga-yellow to her Phoenix bluegreen. A nice thing to say about her new name is that German cruiselines like to use names of old sailingships for their new passengerliners. Earlier, now defunct Holiday Kreuzfahrten named one of their ships Lili Marleen and Alexander von Humboldt was named like a well-known lovely mintgreen barge built in 1906. In 2011, a new ship has been built as a trainingvessel to replace this former beauty, under the name of Alexander von Humboldt II. A picture of her can be seen below. Under the name of Alexander von Humboldt, the ship sailed a few years in charter for Phoenix Reisen. For them, the ship only recieved another colour on her funnel, changed from the Saga yellow to the bluegreen of Phoenix. She never recieved the albatros logo, though. Underneath, to be complete, a picture of the 2011-built sailingvessel Alexander von Humboldt II is added, while she passed Velsen Noord on the 1st of may 2013. This is a replacementship for the 1906-built Alexander von Humboldt, a trainingship that was used before her. Recently, the name of Swan Hellenic Cruises was bought by Lord Sterling after Carnival Corporation decided to stop the sailings of this one-ship company in 2006. He was the chairman of P&O when Swan Hellenic was owned by that company. Lord Sterling announced that he would search for a suitable vessel to continue cruises under the Swan Hellenic banner and almost immidiately sold the name to All Leisure Group, a company offering educational cruises from 1984 onwards. They found a perfect ship for this role, the Alexander von Humboldt. In april 2008, the ship recieved her new old name Minerva again for the revived Swan Hellenic under a charter for six years. In the beginning of 2012, Minerva had a large upgrading during 83 days. During this time, the ship recieved 32 extra balconies and a new forward obeseration lounge and bar. Also a new internet lounge was installed, just as a new promenade deck. Next to this, the cabins were also upgraded with new facilities so the ship would be more attractive to her passengers. But sadly this was not improving her performance, as the company was creating high losses from 2014 onwards. In january of 2017, the parentcompany All Leisure Cruises was declared bankrupt, and so it's cruisedivisions Swan Hellenic and Voyages Of Discovery were ended. For Minerva, again a new home has to be found.